Seldom does one see a butterfly knife of this complexity. The hours that went into the carving, inlay, engraving, leather tanning, sewing, and Damascus work are incalculable. The spring-loaded self-locking latch is an invention of Brianâ€™s. 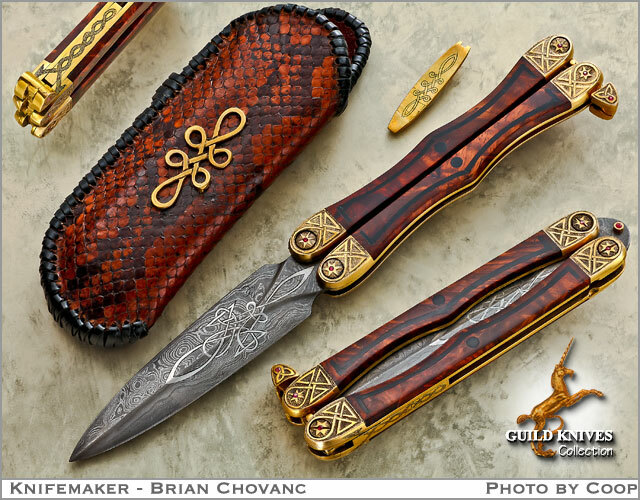 There are over 100 separate hand made pieces in this masterpiece, and it is definitely the most enchanting Balisong that Iâ€™ve ever seen. Pouch/Sheath: Handmade Reticulated Python with Deer skin lining, hand laced thongs, and keltic carved brass appliquÃ©s, all by maker.